In her tweed skirt and sensible shoes, sixtysomething church elder Sigrid doesn’t look like a revolutionary. She carries neither iPhone nor gun, but revolutionary she is. She has been at the heart of a movement that toppled an oppressive regime, thawed the Cold War and brought down the Berlin Wall, opening East Germany to unification and democracy. This softly-spoken woman was part of changing German, and world, history. 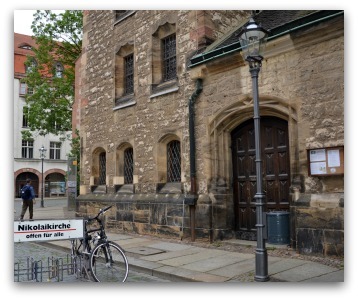 Sigrid was there where it all began – Leipzig’s Nikolaikirche (St Nicholas Church, pictured above) deep in East Germany, every Monday night for peace prayers, discussions and peaceful demonstrations in the years leading up to the fall of the Berlin wall. ‘It started with about 15 people,’ Sigrid explains as she pours me a coffee in a simple back room of the church. ‘We used to go once a year for a peace retreat, but then we decided to do it every week. ‘Then more and more people came. Not just Christians – anyone was welcome and they came to discuss the situation, to air their grievances, to discuss disarmament, environmental issues, human rights and freedoms. Inevitably the movement attracted the ire of East Germany’s brutal security forces which surrounded the church with roadblocks and security checks. There were arrests and temporary detentions every week as well as threats, brute force and bashings. The highways leading into Leipzig on a Monday were closed. 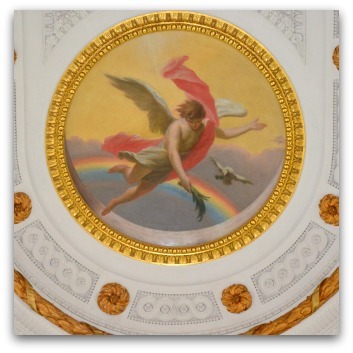 ‘Angel of Peace’ (pictured below) was painted hundreds of years earlier above the altar. Young people wore an image depicting ‘swords into ploughshares’ on their shirts, drawing on the prophetic Old Testament imagery. It became the symbol for the movement, spreading to Berlin and other churches in East Germany which supported, and provided havens, for the nonviolent resistance. She explains the simple, yet profound strategy that proved the decisive factor. It left East Germany’s hardline riot police baffled. At one point Sigrid, a board member of the church at the time, was called to the Mayor’s office and urged to stop the weekly meetings. She told the mayor they would continue. Another time the Stasi, East Germany’s notorious security agency, sent 1000 agents to one of the gatherings. They sat through the prayers and reflection, listened to the radical message of the gospel and, it’s claimed, many were profoundly affected as they heard the Sermon the Mount being read and discussed for the first time. Then on October 9, 1989, more than 2000 people leaving the church were welcomed by an estimated 70,000 waiting outside with candles in their hands chanting ‘We are the people’. It was at this point, Sigrid explains, a miracle of peace and nonviolence occurred. The next week, 120,000 people showed up, the following week, the number more than doubled to 320,000. This consistent, peaceful, respectful, nonviolent pressure, lead to the fall of the Berlin Wall on November 9 and the East German ideological dictatorship collapsed. ‘We planned everything. We were prepared for everything. But not for candles and prayers,’ said Horst Sindermann a former East German Central Committee member years later. The Monday night prayers for peace continue at Nikolaikirche. Leipzig’s down-and- outs come for a coffee and chat – it is still a church ‘open for all.’ Programs for the unemployed and migrants are staffed by volunteers such as Sigrid who follow a simple teaching, a teaching that, when practised by the people together, is known to lead to revolution. Donna Mulhearn is an Australian journalist and peace activist currently travelling through Germany gathering stories on the impact of war. She is en-route to Iraq where she will document the impact of depleted uranium weapons on the Iraqi community. Thank you Donna, for telling us this hidden story. It is inspiring and an encouragement to continue on the path of contemplative activism. Each day, the news brings more of the violence and complexity of our world. The simple, pure truth of the Gospels, as followed by Sigrid, reminds me that ordinary, simple actions, underpinned by Love and Hope, can transform the world. You write "The story of Nikolaikirche is the untold, under-rated, almost unbelievable story of the fall of the Berlin Wall." Well, if it was under-rated you make up for it by grotesquely overrating it. The facts are that once the Soviet regime decided not to use force to suppress the Solidarity in Poland and tolerate removal of puppet communist government there, another puppet government in East Germany could not be sustained. Look at the map and draw the conclusions. May this beautiful story someday be made into a movie! So happy to see an article by Donna Mulhearn! You go girlfren! A very inspiring article. I have often wondered why the wall fell so abruptly. Shades of the wall of Jericho.